This fascinating eBook is a 'reprint' of the 1926 book written by a Bishop who was also an ardent freemason. 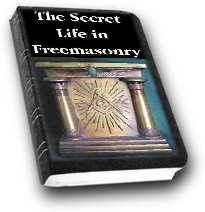 It gives a fascinating insight in the hidden meanings of the masonic rituals with references to the ancient religions of Egypt. It's a must for all of those interested in the esoteric traditions of the masons. Personal Experience. Egyptian Evidences. Preservation of Rituals and Symbols. The Egyptian Outlook. The Hidden Work. The Egyptian Race. The Grand Lodges. The Ordinary Lodges. The History of Masonry. Form and Extension. Orientation. The Celestial Canopy. The Altar. Pedestals and Columns. Orders of Architecture. Meaning of the Three Columns. The Pillars of the Porchway. The Ornaments. The Mosaic Pavement. The Indented Border. The Blazing Star. The Furniture. The Movable Jewels. The Immovable Jewels. The Co-Masonic Ritual. The Procession. The Apron. The Ceremony of Censing. Lighting the Candles. The Brethren Assist. Tyling the Lodge. The E.A. S ... n. The Officers. The Duties. The Opening. The E.A. K … s.
The Candidate. Divisions of the Ceremony. Preparation of the Candidate. The Inner Preparation. The Three Symbolical Journeys. The O …. The E …. I L … s. The S … and P … Examination and Investiture. The Working Tools. Egyptian Interpretation of the Working Tools. (Second Edition: The Working Tools, and the Egyptian Interpretation of Them. The Questions. The Preparation. The Inner Preparation. The Opening. The E.A. 's Last Work. The Five Stages. The Five Steps. The O. The Working Tools. Closing the Lodge. The Opening of the Lodge. The C … The Pre­paration. The Internal Preparation. Entering the Lodge. The Seven Steps. The O … The Etheric Forces. Hiram Abiff. Death and Resurrection. The Star. The Raising of Humanity. Fire, Sun and Moon. The Villains. The Masonic Plane. The Ceremony of Installation. The Mark Degree. The Holy Royal Arch. Still Higher. The Rose Croix. Black Masonry. White Masonry. How to Use the Powers. Our Relation with Angels. The Workings in Egypt. The Form of the Temple of Amen-Ra. The Building of the Temple of Amen-Ra. The Unveiling of the Hidden Light. The Offerings. The Descent of Osiris. The Distribution of the Sacrament. The Re-union of Osiris. The Shining of the Light. The Pledge and the Blessing. The Ceremony of the Holy Angels. The Lodge and Officers. The Triangle of Adepts. The Arrival of the Angels. The Building of the Temple of the Angels. The Ceremony in the Temple. The Effect of the Festival. The Greetings. Preparation for Closing. The Closing. This version has been carefully reset as a pdf file, and has the original illustrations. Please remember that this is an EBOOK and is available for INSTANT DOWNLOAD. You will NOT be receiving a paper copy of this book, although, as a pdf file, you will be able to print this out for your own or friends' perusal. You may resell this book in its current form providing you don't change it in any way.